Please contact me, if someone is interested in a trade or sale. Please ask me for what ever you want if it is something for carcassonne or dominion, you can ask me also for rare things. 2. 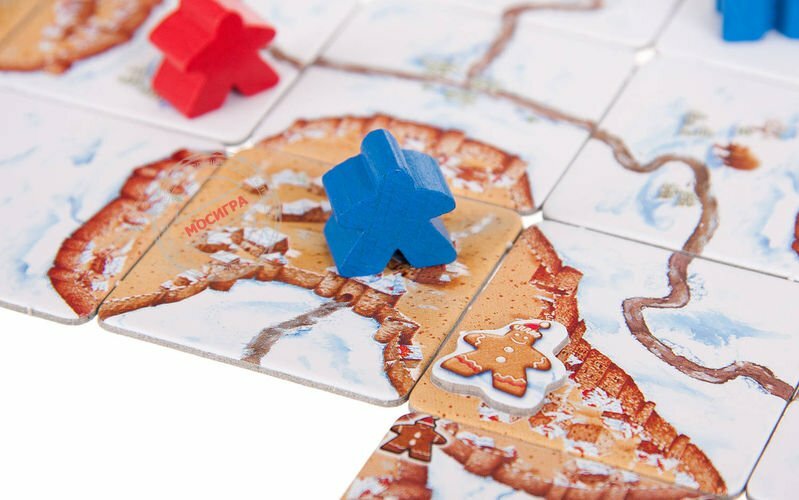 Gingerbreadman-tile included in Каркассон. Зимний праздник (karkasson-zimnij-prazdnik) or the full Expansion because its a limited edition. Thanks for your help, but I´m really searching only for the russian one (the one in the middle of the next pictures). You may try to byy Каркассон. Дворяне и башни here http://tesera.ru/game/178730/. But the expansion has not been produced in Russia. So you can buy only used item. Russian issue of Winter edition is rarity. 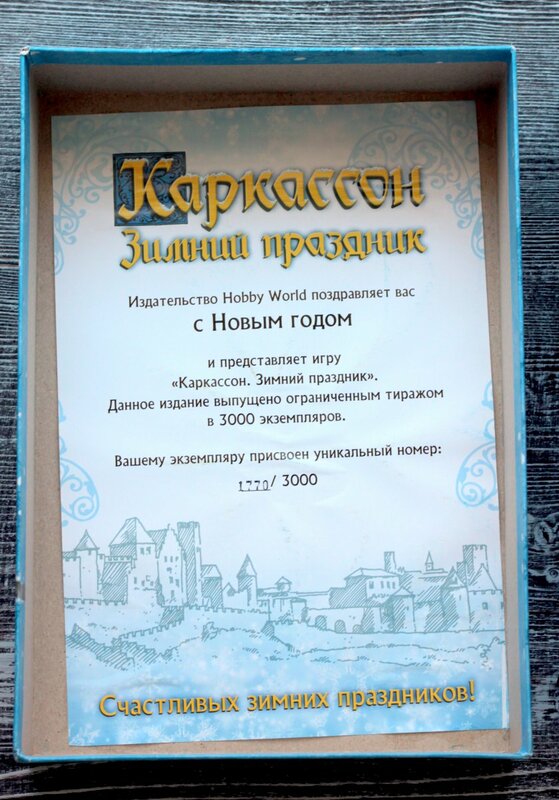 Russian version of Big box named Дворяне и Башни with unusul single-count-tile is in stock again: https://hobbygames.ru/karkasson-dvorjane-i-bashni. Does the Russian three-expansion box include the Crop Circles I? One of the preview images shows Crop Circles titles. I am trying to figure out if that is just a stock image from the "Carcassonne Minis" collection or something else. It includes Crop CirCle I. See the site with better picture of the mini: https://www.igroved.ru/games/carcasson/carcassonne-dvorane-bashni/. Just going to say it: The Russians are doing a better job of Carcassonning than any other country. With just five boxes, you can get the base game and Wheel of Fortune, seven full-sized expansions, and nine minis (The Carcassonne Minis, Crop Circles I, and The River I), plus you get The Scout for Hunters & Gatherers, which has been out of print elsewhere for nearly a decade. Pretty good deal. Forget a big box, get these four Russian boxes. I can't wait for a big box with the other three large expansions, possibly supplemented with some of the remaining minis. Wow. That's incredible. Do you or anyone else know of any links to the Russian combo box containing Wheel of Fortune? Do you or anyone else know of any links to the Russian combo box containing Wheel of Fortune? Wheel of the Fortune has not been published in Russia from 2015 and I guess will never be printed again. Check out: https://www.igroved.ru/games/carcasson/carcassonne-wheel-of-fortune-rus/. The set includes Wheel of Fortune and Bridges, Castles & Bazaars. The first expansion combo box "Royal Gift" includes the Carcassonne base game, Inns & Cathedrals, Traders & Builders, Abbey & Mayor, and King & Scout. See: https://www.igroved.ru/games/carcasson/carcassonne-predmestiya-obitateli/. This box is also available without the base game under the title "Suburbs & Inhabitants." The second expansion combo box "Nobles & Towers" includes Princess & Dragon, The Tower, The Count, The River II, Corn Circles I, and The Cult. See: https://www.igroved.ru/games/carcasson/carcassonne-dvorane-bashni/. Wheel of the Fortune has not been published in Russia from 2014 and I guess will never be printed again. Sad times. Looks like a fun box set. Yes seriously the Russians have amazing deals for all of them!! 1) Marked back side of tiles with Russian letter K (in 2003-2005) and it was very clever strategical decision. But Russian Carcfans in this period (up to 2011-2012) hated the publisher for it because we could buy base game without high shipping costs but couldn't buy any expansion (the publisher couldn't to reach an agreement with HiG about publishing the expansions). We bought Big Boxes from small Russian dealers of board games delivered them to Russia under an order and then bought the expansions from European e-shops. Even now many of Carc-minis (Plague, Tunnels and so on) are not published with K-letter. 2) Made very good distribution of expansions between Russian BigBoxes when agreement with HiG had been reached. The most of them do not include base game so they are cheaper then HiG, RGG, Z-man versions. There are no duplicates in the expansions. But all of this is a consequence of the advantage of Going_after. And it can't be an excuse for a decade of waiting! It has been out of stock for 2 years.